To describe the ‘Chameleon Mix’ editorial shoot lensed by fashion photographer Ben Toms for the January 2012 issue of Dazed & Confused magazine as colorful is clearly a major understatement. Showcasing an eclectic selection of ensembles boasting chromatic hues, loud prints and wild patterns, the Ben Tom shoot is both vibrant and quirky. Shot in the studio, the editorial features male model Yannick Abrath. Outfitted by stylist Robbie Spencer, Abrath is seen donning designer labels including Prada and Givenchy. 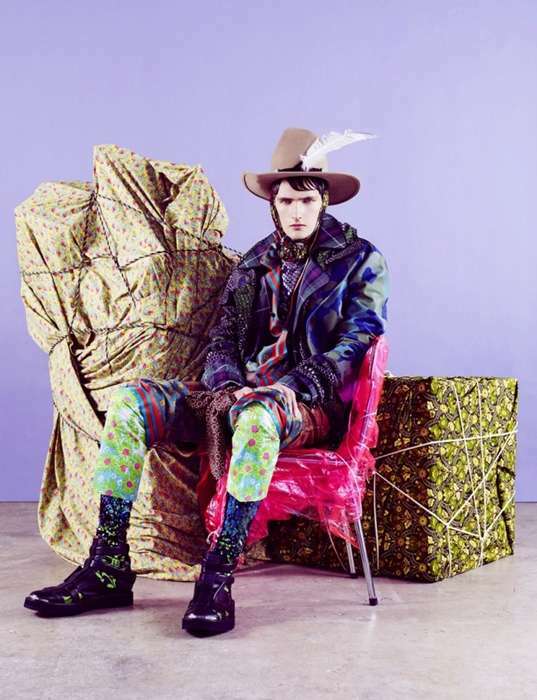 The set design, courtesy of Simon Costin, complements well with the overall theme of the shoot, and most importantly, the brightly hued and eccentric pieces rocked by the model who exudes a boy-next-door charm. Ultimately, the 'Chameleon Mix' shoot by Ben Toms is set to attract viewers' attention for its bold presentation.